Huge Thanks to Water Damage Restoration Dallas Texas for this punchy Guest Post. These Time Management Tips for Mom Entrepreneurs were so SPOT ON, I was going, “oh yeah”, “aha”, “mmm yes” all the way through. Being an entrepreneur Mom, you don’t have considerable time on your hands and have much to do. The kids have to be taken care of, someone needs to run your business, hubby would appreciate some time with you, don’t forget the chores, and not to mention you could use a little TLC for yourself. Can sleep fit in somewhere too? Stretching yourself in multiple directions can cause stress and anxiety; possibly making your day counterproductive. If only there were more hours during the day… Well, we can’t add an extra hour to the clock but there are time management tips you can use for some relief! It’s difficult to manage time when you have kids to look after. They need help getting up in the morning, going to school, getting picked up, extracurricular activities, homework, dinner and the list continues – not even including the babies and toddlers that stay home! The days can be a bit chaotic and a set-in-stone schedule is not doable. So, work when the kids are asleep! This may require you to adjust your sleep or nap time but you will be able to get more work done when they are sleeping rather than when they are busy throughout the day – saving you time in the long run. At Water Damage Restoration Dallas Texas, we know to not underestimate the value of planning everything ahead of time. During your free time, begin mapping out what needs to get done the upcoming week. It may be hard to plan an intricate hour to hour schedule but you can at least make daily goals. Make the only must follow timelines revolve around important events like appointments, taking the kids to soccer practice, picking them up from school, etc. If anything from your work – emails, shipments, meetings – need to be taken care of a certain day, plan to have them ready to go the day before. That way, you don’t have to spend the deadline day stressing about what is going to happen. Don’t expect the schedule to exactly go according to plan but having something to reference and guide you will definitely save you some time! You can hire a virtual assistant through an online freelance hiring site at a cheap hourly rate. Normally, you will be able to view profiles and see previous work they have done and client comments or satisfaction rates. With someone else spending a few hours a day helping you get work done, you will have more time to work, spend with the family, or catch up on the sleep you have been missing! Benefit from free work by having family help, like from your kids and significant other! If you just need to keep the little ones out of your hair, kid-proof your office to prevent a disastrous mess and dedicate part of the room to a kid-office. Set up an area where they can color and do activities. It keeps them entertained and in your sight. For the older helpers, have them do things like organizing folders, stamp letters, package items and so on. Not only can you get twice the work done but you also get to have family time together! 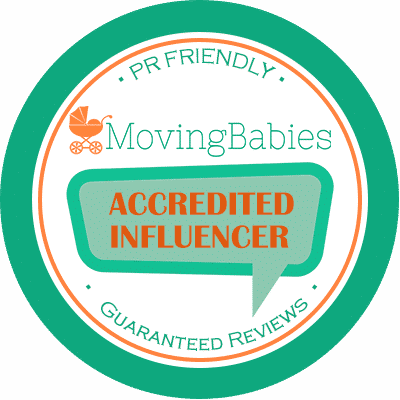 Mompreneur hours rarely often follow a set 9-to-5 schedule. There might be appointments to go to, nap times for the kids can vary, half-days at school will come your way and the list can go on. You will drive yourself mad trying to get everything done with an inflexible time frame. You will be surprised with home much time you lose when you have to constantly fight to have it. So, work on a nap to nap basis. If you have tasks that require full concentration, do them before the family gets up or when they go to bed. Prioritize appointments and errands during traditional day time hours. For miscellaneous tasks like emails and filing, you can accomplish the wherever you see fit to do so. Sometimes, the best way to complete a task is to dedicate a window of time and block out any distractions. That’s how we do it here at Water Damage Restoration Dallas Texas. When you sit down to work, give yourself 15-20 minutes to do it. Turn of disruptions like social media and emails so your concentration does not get broken. Taking 20 minutes to finish something is more time-saving than having to spread out 10 minutes here and there when everything else is still happening. Finally, just do what you can when you can. Instead of having to stop to read things, listen to audio books as you work, jog, or go to pick the kids up from school. Stamp envelopes during commercial breaks when you are watching your favorite show. Answer an email or two when you are waiting at an appointment. Once a week, buy takeout instead of cooking. Not only will the family appreciate it – you can make it into a weekly tradition – but the time you would have spent cooking can be used somewhere else. Being a mompreneur demands a lot of time. You can help yourself out by effectively dividing time with time management tips. You and your family will be grateful! 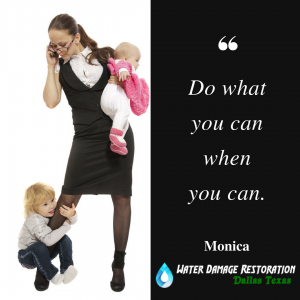 This article is written by Monica, a part-time writer at waterdamagerestorationdallastexas.com. When she isn’t writing, she is preoccupied with spending time with her two sons. Oh my goodness, I’m the Queen of squeezing in time wherever possible (might have become a bit of an addiction). And I often fall asleep with my little one at 7 pm and get up at 3 or 4 in the morning to work. I’ve also been toying with the idea of hiring a VA for some of my article research. Which tips are you keen to try? 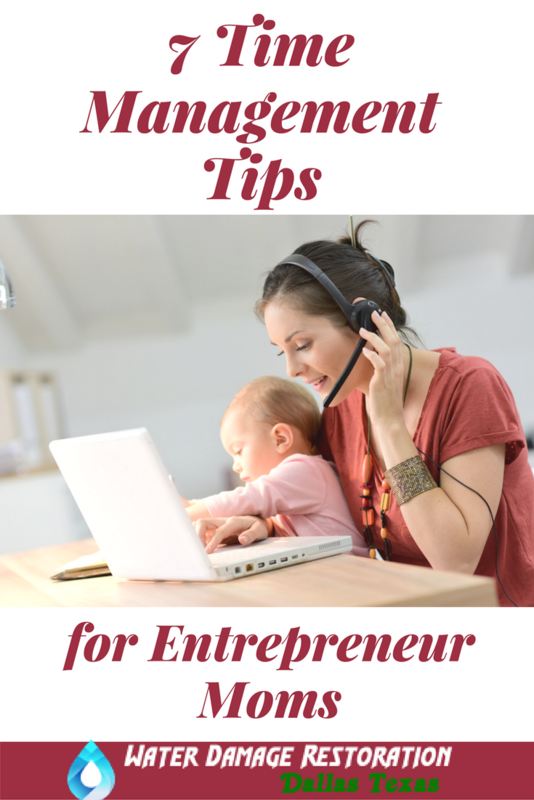 7 time management tips for Mom’s entrepreneur is practical and useful to any mom who nurtures kids and earns for a living. I think that your tips are come up with your experience. Thanks for your brilliant ideas. Some of your tips are helpful for me to manage my working time. So pleased to hear you also found this post helpful. Thanks for your comment. Having a toddler at home who requires a constant attention, I found some of your tips really helpful. Some of them I;m already implementing like working whenever she sleeps and squeezing in time wherever possible. I got into the habit of listening to audios, while I’m doing my housework and it works great. Saves me lots of time. I picked up few tips which I want to try. Timer is one of them. Why I never thought about it? I think it will really help me to focus on a task and limit distractions around. I also like the idea of hiring a VA. Would you hire one from the US/UK or from overseas? The rates are cheaper overseas but I wonder if you get the same quality of work done. Hi Zuzana, fab question, thanks! My initial thought was to hire a professional VA in India as I’ve heard they are brilliant and their rates are fantastic. But having given it more thought, I think I would hire a student here in South Africa as our unemployment rate is super high and it would be a way of giving back to the community. Thank you Lauren for having Monica as a guest post writer, this is some really powerful stuff. I came across your blog because I was searching for some information as my girlfriend is pregnant. 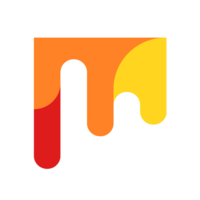 And I stumbled upon your mom Entrepeneurs blog. And I think that this is not just relevant to moms but everybody. I really liked the tips of actually having a timer so you can get the work. Just WOW. I have a little experience on VA, and you can actually find good VA from South Africa on http://www.upwork.com. You just need to narrow down the location as to who/and where they are from can see your project. I agree wholeheartedly, Kim. I was delighted to receive this post as its so apt. Aah, your girlfriend may enjoy our sister site too, Happy Human Pacifier. Thanks so much for sharing your VA experience. Have you come across any South African VA’s on Fiverr? I’m on Fiverr more than Upwork. I havent seen any on Fiverr from South Africa that I can remember. But I use both Upwork and Fiverr very diligently. I use Fiverr very often to get ideas, or to buy my girlfriend gifts and so on. A few years ago I bought my girlfriend some rice with our names written on it. And they were glued to a very smooth stone (the ones you see on the beach) and a magnifier glass. (So she can read whats on it) But yeah, I find all kinds of rare gems on Fiverr. This year I’m going to make one myself, a lightbulb with beach sand in it. And some moss in it and a crocodile or something…. Wow, interesting! I didn’t know you could find that kind of thing on Fiverr. Thanks for sharing your knowledge and ideas.